Of Mar, peacefully at Grey Bruce Health Services Wiarton on Wednesday, November 27, 2013 at the age of 58 years. 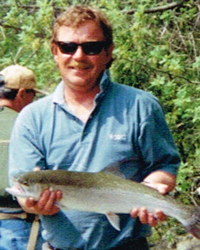 Steven's family invite you to gather with them for a Memorial Gathering on Tuesday, December 10, 2013 from 1-3 pm at the Thomas C. Whitcroft Peninsula Chapel, 272 Berford St., Wiarton (519) 534-5341. Cremation has taken place. Donations to the Liver Foundation would be greatly appreciated.